He's not the only one who is happy this blanket is finished! My next project will be a lot smaller that's for sure. This is the little brother to the Big Granny I completed earlier, early August if this blog is anything to go by. I'm pretty darn happy I managed to complete both blankets this year! I am VERY slow at crochet, and knitting, perhaps because I don't do enough, but I suspect also technique? After a few nights of trying to get this one finished my right arm and wrist were a bit sore. This one didn't end up as big as the first one, the yellow yarn ran out quicker than I expected and I decided to let it go at that and not buy anymore yarn for it. 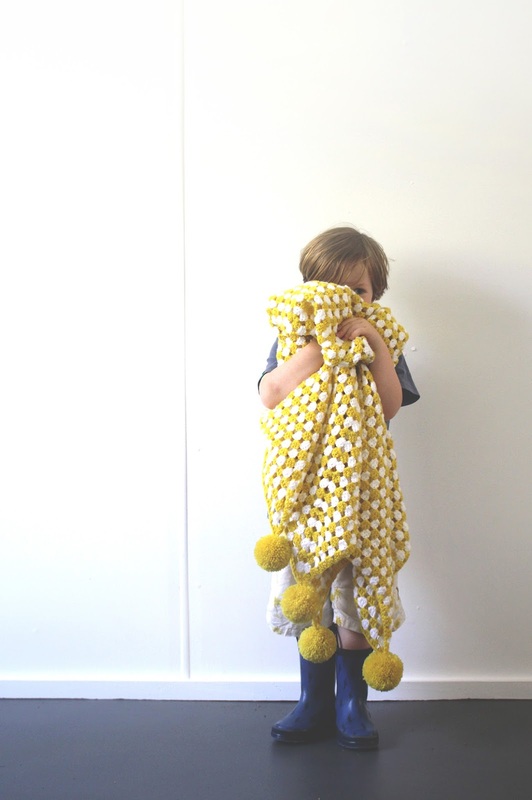 When I reached the last ball of yellow - which was primarily reserved for pompoms - I finished it off. And please don't say 'you could have made white pompoms' or anything like that. You know me. I scaled the pompoms down a little too, and I think they came out just right for the size of the blanket and the size of the owner of the blanket! It looks fabulous. Oh and I totally agree about the pom poms of course they had to be yellow! Sod's law dictates that, had you gone to get more yellow it would be subtly different either in colour or thickness. Yes or possibly not even there! It's a pretty random shop. Those little yellow pompoms were the perfect touch! Thanks Britney! I actually debated tassels for one mad moment there ;) Maybe on another project!